Not bad, I guess. Decent, but not scary. So for 2 mana you get a Fire Fly and a Flame Elemental AND they have lifesteal (allowing them to synergise with the druid healing package)? Token druid is still in the game. Nice synergy and reasonable bodies for the mana cost. Damn, this one is strong. Token druid will be a thing I guess. Anyone have a pic of the tokens? I wish this was 1/2 treants with life steal instead. Which archetype are they trying to push anyway? Obviously a strong card. I have no doubt token druid will be a thing as I am already playing a decent mech token druid and these new cards are much better than what I am working with now. Good question. I think it's token and the heal spells are meant to replace the armor mechanic that was previously being pushed harder by druid than warrior. I think they are trying to return Druid to its roots of being token/agro formats rather than ridiculous amounts of armor. If only Happy Ghoul was still in Standard! Definently a cool card, will see play in any half-decent token druid. I like such cards a lot, low cost, very playable, but not game breaking. 2 mana 2/4 lifesteal is really nice stats. Nice, some more ways to heal. Involves buffing them to get a larger heal of course, but still decent value. Token druid is getting a lot of support in the new expansion, and its an archetype thats not affected by the ramp spell nerfs. This is a strong card, but I would like it better if the tokens were treants. This into Ornery Tortoise seems like a good curve. Heal up enable the stag, so kinda Token/Beast hybrid with heal package seems pretty solid for now. a vanilla 1/2 is worth about .5 mana, lifesteal seems to be worth about .5 to 1 mana. 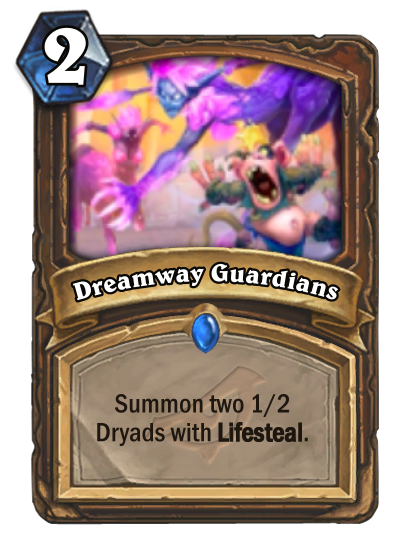 2 1/2 minions with lifesteal (in druid) for 2 seems to be a good deal in a vacuum, now add buff potential and you got a solid early game card that can be used in a deck that doesnt run a lot of early game minions. Something druid has been doing for a while and take advantage further of going forward. Also the 2 slot for druid (since WG nerf) is basicly wrath and nothing, so this (along with the new leggo) is prolly shoo ins for most builds. One of the reasons fire fly was so good was that you could get it onto the board on turn 1. This does not help with that.